The Akari 3A floor lamp is part of the Akari light sculptures, designed in 1951 by the American Japanese artist and designer Isamu Noguchi. The name ‘akari’ was chosen to describe these objects because it means ‘light’ in Japanese, referring to both illumination and physical lightness. The idea for the design originated from a visit to the Japanese fishing village of Gifu, where Noguchi watched the fishermen at work. They did not only use trained cormorants to hunt, but also lanterns to attract fish. These lanterns had ribs made of bamboo, which were covered with fine paper. For the 3A Floor Lamp, the designer uses paper from the mulberry tree, guaranteeing a soft, warm and uniform light distribution. The spherical shape of the lamp’s body is supported by a three foot high painted steel wire, ensuring a certain lightness. The harmonious combination of details made of wood and bamboo give additional character. The lamp of 560 cm can be placed on a table, as well as on the floor. Thanks to the soft light distribution and exceptional design, the Akari 3A floor lamp brings warmth, comfort and style to any living room. Isolated product image of the Akari 3A floor lamp by Vitra. Made from paper of the mulberry tree, the light guarantees a soft, warm and uniform light distribution. 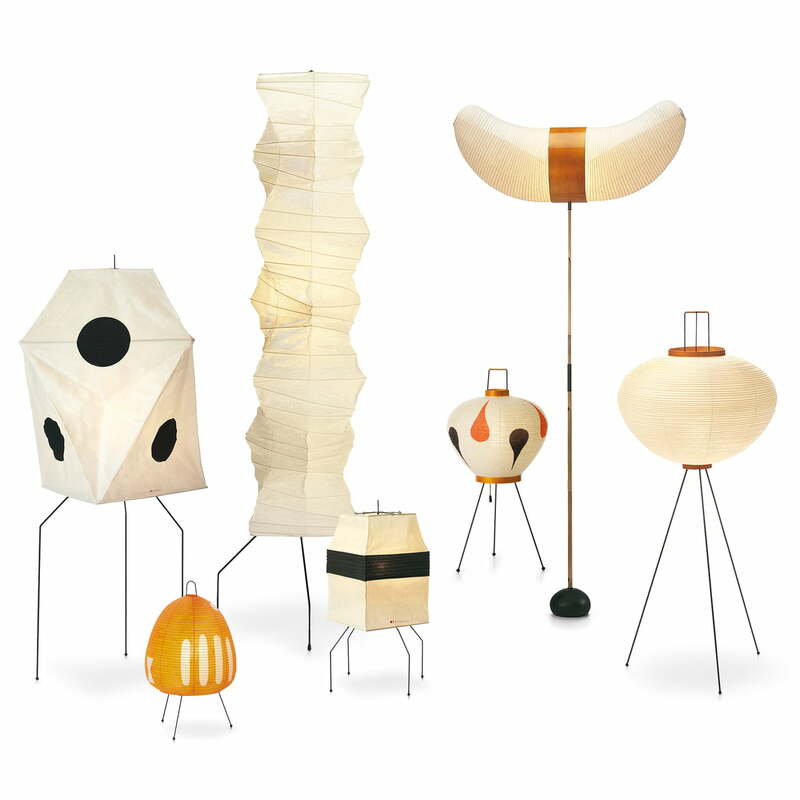 Group image of the Akari Floor Lamps by Vitra. The Akari lamps of the designer and artist Isamu Noguchi are light, bright and delicate as the light itself.